Did you know that India has the largest number of illiterate adults in the world? That's a whopping 287 million people or 37% of the global total. While both the government and media are doing their bit in order to bring down these numbers, the actual need of the hour is to think of new and contemporary ways of engaging this huge population. Like the Boat School, a new initiative started by NGO Guria and led by Ajeet Singh, to help the children of Varanasi who waste their time aimlessly, straying near the banks of the river Ganga. Most of these children were not attending school when Ajeet spotted them. The usual culprit: high school fees. Varanasi or Banaras, as we all know, is thronged by zillions of religious fanatics every year, clearly making it the center of cultural and traditional exchange. No wonder, it is hailed as the Athens of India. Among the increasing chaos and pollution that form the first impressions of the city, the Boat School aims to be different and truly a stepping stone in the vast ocean of learning. The children spend at least a couple of hours in the school. The idea is to provide them a place where they can study, play, or even revise without having to worry about anything. Essential learning is imparted in a no pressure or tension-free environment, which is truly stimulating for the young children. However, a magical transformation is also needed for the school to succeed. For instance, the school's interiors require restoration and redecoration. Funding is the major roadblock for providing the children with the necessary books, CDs, furniture, stationary, and toys. That's just the tipping point. 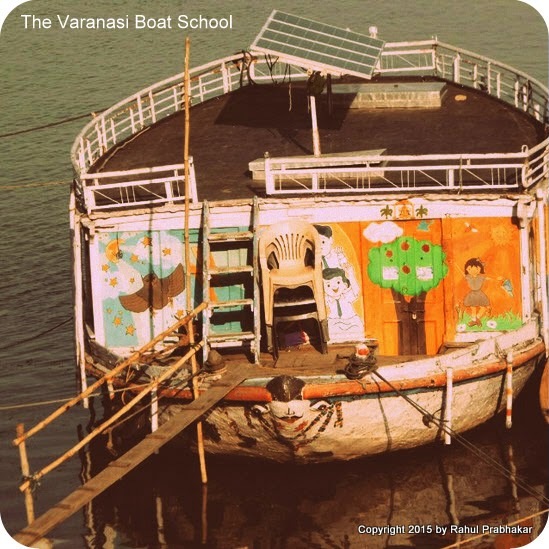 If the Boat School succeeds in this small town of Banaras, you can expect a flurry of similar schools in the rest of India, ensuring a wonderful future for India. Visit www.doright.in and promote the site using your social media network. You can also join Doing Right’s Facebook, Twitter, YouTube, or Instagram pages. Help the Boat School to spread its wings in all parts of India and contribute towards the journey of doing right. Finally, as Ajeet says, "The Varanasi Boat School is a tool, it is not a goal." I couldn't agree more. Urge all of you to do right and create an ideal learning environment ... one that these children truly deserve.